The cruel slaughter of pilot whales each year in the Faroe Islands! Each year in the summer months the so called Grindadráp is taking place in the Faroes Islands. Around 800 long-finned pilot whales and many Atlantic white-sided dolphins are killed in this non-commercial and organized slaughter which has existed as a tradition for centuries. Anyone who has a special training certificate in slaughtering a pilot whale with the spinal-cord lance can participate. This was not necessary earlier, but because of constant criticism from animal welfare organizations, the Faroese people try to improve the slaughtering methods in order to make them more “humane”…. 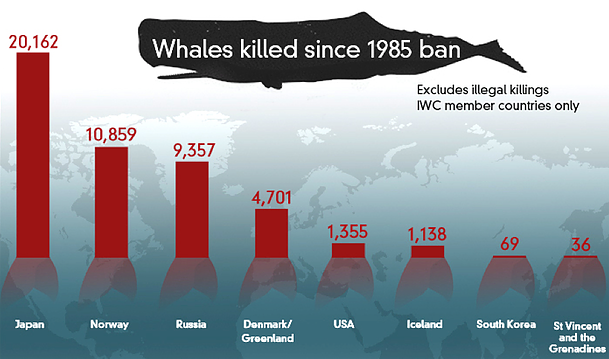 Still with the new method the whales suffer hugely as most do not die instantly. Many Faroese consider the hunt an important part of their food culture and history. As of the end of November 2008 Høgni Debes Joensen, chief medical officer of the Faroe Islands and Pál Weihe, scientist, have recommended in a letter to the Faroese government that pilot whales should no longer be considered fit for human consumption because of the high level of mercury, PCB and DDT derivatives. However, the Faroese government did not forbid whaling. There has later been discussion about how much whale meat the Faroes people should consume and current levels of mercury, PCB and DDT. Still this hasn’t stopped the hunt! Animal rights groups criticize the hunt as being cruel and unnecessary. The Faroese food and veterinary authority announced in 2011 their recommendation to the Faroese people regarding the safety of eating meat and blubber from the pilot whale, because of the pollution of the whale. The government and politicians has still not banned the consumption of whale meat and defends the senseless inhuman slaughter! Just to continue with this cruel slaughter because of old tradition is not only unnecessary (there is enough food from other sources) but inhumane and greatly endangers our food chain and world supply. Killing zone: Using ropes to pull the pilot whales up the beach, the locals begin cold-blooded to kill the whales without any mercy! Letting even their own children watch! Tied down, none of the whales are able to escape the locals’ spinal lances and are quickly slaughtered into pieces! The hunters first surround the pilot whales with a wide semicircle of boats. The boats then drive the pilot whales into an authorised bay or to the bottom of a fjord where the slaughtering takes place. It is not permitted to take whales on the ocean-side of the rope. The pilot whales that are not beached were earlier often stabbed in the blubber with a sharp hook, called asóknarongul, (a kind of gaff) and then pulled ashore. But, after allegations of animal cruelty, the Faroese whalers started using blunt gaffs (in Faroese: blásturongul) to pull the whales ashore by their blowholes. As of 2012, the ordinary gaff is used only to pull killed whales ashore. The blunt gaff became generally accepted since its invention in 1993, and it is not only more effective, but it is also more “humane” by comparison to the other gaff. However, anti-whaling groups, such as Greenpeace and the Whale and Dolphin Conservation Society (WDCS), claim that the partial blocking and irritation of the airway hurts and panics the animal. Furthermore, in 1985, the Faroe Islands outlawed the use of spears and harpoons in the hunt, as these weapons are considered to be unnecessarily cruel to animals. Once ashore, the pilot whale is killed by cutting the dorsal area through to the spinal cord with a special whaling knife, a mønustingari (spinal cord cutter), and after cutting it, the whaler must make sure that the whale is dead, he can do this by touching the whales eye; before he cuts the neck open, so that as much blood as possible can run from the whale in order to get the best quality of meat. The neck is cut with a grindaknívur, but only after it has been killed….so they say! The mønustingari is a new invention which has been legal to use to kill pilot whales with since 2011, and since 1 May 2015 it is the only weapon allowed to slaughter a whale. The length of time it takes for a whale to die varies from a few seconds to a few minutes, with the average time being 30 seconds. Other observers complained that it took up to fifteen minutes for certain whales to die; they noted several cuts were sometimes made before a successful death and that some whales were not even killed properly until a vet finishes the job. With the new law which prohibits the whale hunters to stab the whales from the boats, this should not take place any more!… According to the new Whaling law (Grindalógin), it is only allowed to kill the whales from the shore which means it is not the men who hunt the pilot whales with their boats who are slaughtering the whales, but men who are waiting on the beach with blowhole hooks with rope and spinal cord knives. 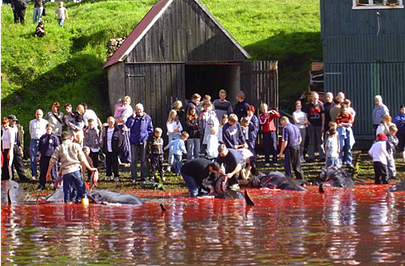 The Faroese legislation also permits to hunt certain species of small cetaceans other than pilot whales. These include: bottlenose dolphin, white-beaked dolphin, Atlantic white-sided dolphin and harbour porpoise. 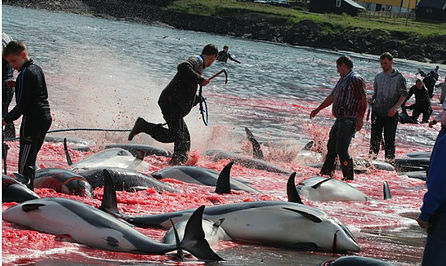 The slaughter of these dolphins (with the exception of harbour porpoise) is done the same way as the whales! The Convention on the Conservation of European Wildlife and Natural Habitats (Berne Convention) classifies the Pilot whale and all cetaceans as STRICTLY PROTECTED under Appendix II, prohibiting their slaughter within European Union. While the Faroe Islands are not a member of the European Union, they remain a Danish Protectorate. Meaning that even through the Faroes are self – governing, Denmark controls the police, defence, foreign policy, and the currency. All trade with EU countries is handled through the Danish foreign ministry. The primary reason for NOT joining the EU was to prevent the EU from interfering in their fishing policies! Despite the fact that the slaughter of cetaceans is banned in the European Union, including Denmark, the Grindadráp continues with the support of Danish police and navy, and with the blessing of the Danish government. This year alone 490 pilot whales have been slaughtered in the Faroe Islands with Denmark’s backing. Anti-whaling Denmark, member of the European Union and nominated as “the happiest nation in Europe” WHY do they allow and collaborate in this slaughter?